Finding one place to go online to read all the news you’re most interested in would be like having a little bit of Blackbird’s treasure appear beside the coffee pot each morning. If you’re like me, both have so far been the stuff of legend, yet to make a single appearance. Can trove end our misfortunes? 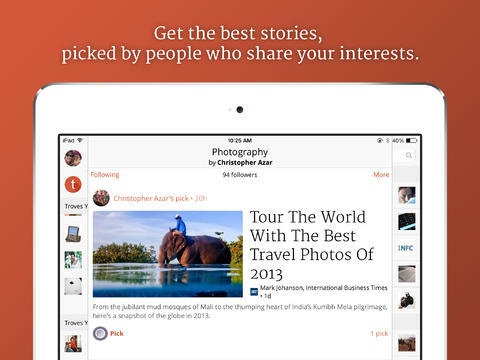 Trove is a blend of social networking, news discovery and aggregation. Articles collect under topics or Troves, pulled from 15,000 news sources. More than mathematics, curators for sharing news and determining what news is of the most value. Curators include the individual user, field experts, or selected friends. Connecting with Facebook and Twitter accounts allows Trove to make news recommendations culled from the feeds of people whose interests resemble yours. As George Carlin once said, “Too many options: not healthy.” It’s quite impossible to sift through all the news sites for articles of interest. Social networks surround news we’d care about with far too much clutter. No one has the time to separate the gold from the garbage. If Trove makes it easier and quicker to find the stories each of us cares about, it will be a godsend. Trove is the newly developed, pivoting survivor of the Washington Post Co. purchase by Amazon’s Jeff Bezos. 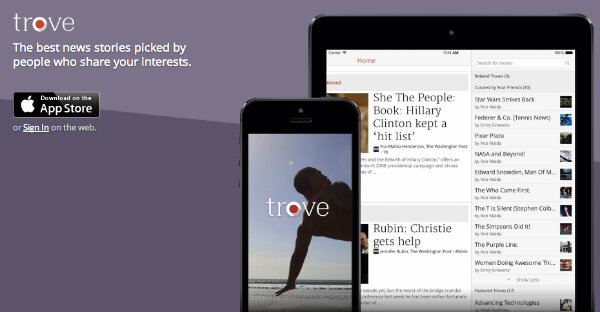 Previously WaPo Labs, the team regrouped to focus on Trove, a refurbished Social Reader – which had shown great promise as a social news discovery app (20 million users in the first year) until Facebook changed its algorithm. Trove has rolled out on Apple devices. What say you, mateys? Does it drown out the noise and surface the real news?